Guest Chef Gordon Ramsay - Sautéed baby onions, lardons, mushrooms and a rich red wine sauce make this fish course into a feast. If you can’t get hold of a large sea bass, use two smaller ones and reduce the cooking time by five minutes. For the sauce, heat the oil in a deep sauté pan and gently sauté the shallots for about 10 minutes, until softened. Increase the heat, add the sugar and cook for another 3 minutes, stirring often, until lightly browned. Season with pepper and add the garlic and rosemary. Cook for another 3 minutes. Preheat the oven to 190C/gas 5. Add the vinegar to the pan and cook until reduced and syrupy, then add the wine and cook until reduced by two-thirds. Pour in the stock and bring to the boil. Turn down the heat and reduce by two-thirds again, to around 250ml. This takes about 20 minutes in total. Meanwhile, using a sharp knife, lightly score the fish three times on each side. Place it in a shallow, ovenproof dish, brush with oil and season with salt. Roast, brushing halfway through with more oil, for 20–25 minutes, or until it feels just firm when pressed at the thickest part. Bring a large pan of water to the boil, drop in the baby onions or shallots, and blanch for a couple of minutes. Refresh under cold water, then peel. Melt the butter in a frying pan with 2 tsp olive oil. Add the baby onions or shallots, lardons and mushrooms and sauté for 8–10 minutes, until lightly golden. Remove them from the pan, then pat dry on kitchen paper and keep warm. Reheat the sauce, strain through a sieve, then return it to the pan. Add a little salt, whisk in the butter and stir in the herbs. Using a sharp, thin-bladed knife, cut along one side of the backbone of the fish and work your way along the rib cage until you have one long fillet. Repeat on the other side, then cut each fillet in half lengthwise. 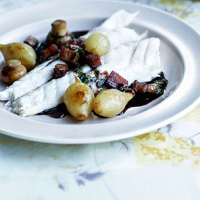 Serve the fish on warmed plates with the sauce, onions, lardons and mushrooms.